Today warning: increasingly sustained gusts. The reliability of the situation is good. Very cloudy sky becoming more unsettled. 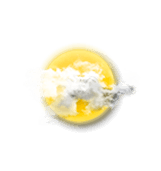 Several clouds, but also several good sunny periods. Unsettled weather becoming very cloudy. Light passing clouds that do not affect the clear weather.